DID YOU KNOW that smoking is the leading preventable cause of death and disease in the United States? Here in Chattanooga, TN we have some of the highest concentrations of smoking in the country. It’s well known that smoking can lead to a number of lung-related diseases but in reality, the negative effects of smoking can be seen in almost every part of the body, especially the mouth. In fact smoking and it’s health complications hit close to home for Dr. Mark and Dr. Ellen McOmie. The Buz Standefer Lung Center at Memorial Hospital is named after Dr. Ellen’s father. He smoked most of his life and passed away from Stage 4 lung cancer. Since his death the family has been working to help people quit smoking and get the treatment they need early to save their life. If you are smoking we want you to quit, in fact we want to help you quit! Many dentist will not surgically place implants for patients who smoke. The vasoconstriction of smoking causes less blood flow which adversely effects the healing process. Implants need lots of nutritious blood flow to heal and be healthy. Dr. McOmie will place implants on smokers but not without serious caution. If you are a heavy smoker Dr. McOmie will not place an implant. The success rate in heavy smokers is just to low. Our patients are more than just patients–they are friends. We care about your health and well-being and want you to count us as a part of your support system to help you quit smoking. If you aren’t quite ready to quit, continue to see us regularly as recommended so we can help you maintain your oral health as best as possible. Talk to us about quitting today and how we can help you! 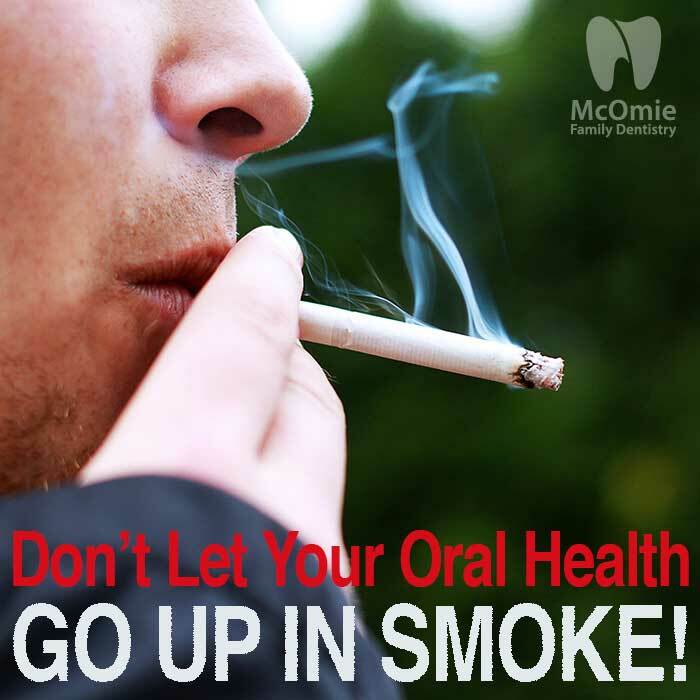 Dr. McOmie has been known to give steep discounts on teeth whitening to smokers who quit! We do oral cancer screenings on every patient for free! We use an instrument called a Velscope that helps us detect oral cancer easier and much earlier. Even if you are not a current patient, you can still come in for a free screening anytime. It is fast painless and simple to be screened. We discussed the benefits to getting oral cancer screening in another post a few months ago so make sure to read more.